Phone (for all calls to French nos leave out the 0 and add 00 33 at the front from England). Landline: 04 67 85 52 12. It's best to use this number first when you phone us either from England or from France. ViaMichelin map of our street and surrounds. If you use this map, please note that they do not show the barrier half way along the rue de la Brèchette, making 2 cul de sacs - our house is in the one you approach from the west end. Although our house is no. 74, there are only 10 or so houses in our little road, which is a cul-de-sac. It's called no. 74 because it's 74 metres from the end of the road. I measured and it is, roughly! So (as in many French streets) other houses have other unrelated numbers, some in the 100s. It's useful when you are driving along a long road to find a house, and you can tell roughly how many metres you can expect to go. Anyhow, if you don't find us most people here know us now, which is good. Lunel is midway between 2 airports, Nîmes and Montpellier. Béziers and Avignon are both also within easy reach. We also have a railway station - if you take the high-speed TGV to either Nîmes or Avignon (or to Montpellier from the west) there are frequent local (TER) train connections to Lunel. Jon and Mary North - married 38 years, parents of three splendid sons and grandparents of three children. Mary was a teacher (of English, music and 'careers' or preparation for work) and then trained and worked as a psychotherapist; Jon trained as a librarian and information worker, and spent most of his working life in the voluntary sector, developing links and partnerships with statutory (government) agencies in the East Midlands. Now retired, we have more time for our interests - music (Jon sings and Mary plays the 'cello - we met on a recorder-playing summer school, Jon has begun to play the recorder seriously again), wine (Jon's especial enthusiasm), knitting (Mary's), books and reading, languages and meeting and talking to people. 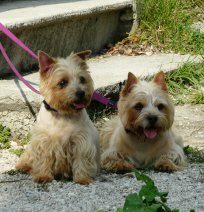 We live in Lunel with Evie, a Norwich terrier (pictured below with Trudy who died in 2012), with Pierre & Charles (tortoises). This page was last updated on: 11 June 2016. Le site est disponible aussi en Français.